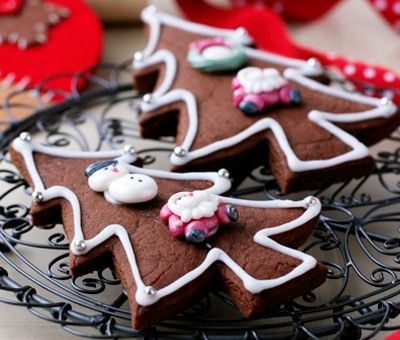 Try these chocolatey version of the classic gingerbread - we love them! Preheat the oven to 180°C, 350°F, Gas Mark 4. Melt the buttery baking spread, brown sugar and condensed milk together. Remove from the heat and allow to cool for 5 minutes. Sieve together the remaining dry ingredients in a bowl, then add the syrupy mixture. Bring the dough together with a spoon first, then kneed gently with clean hands. Roll out the dough on a floured surface to the thickness of a pound coin (or thicker if you like). Cut shapes out. Gently re-knead and roll the remaining dough to make about 10-12 biscuits (it makes less if the dough is thicker). Bake for 10-15 minutes on parchment lined baking sheets. can you make this with just carnation condensed milk? Hi Millie, yes good news the standard and light condensed milks are interchangeable in recipes so you can use either! Happy baking!